Facebook is doubling down on its investment in video with a new tool that will help hardware makers build devices to stream live to the social networking service. 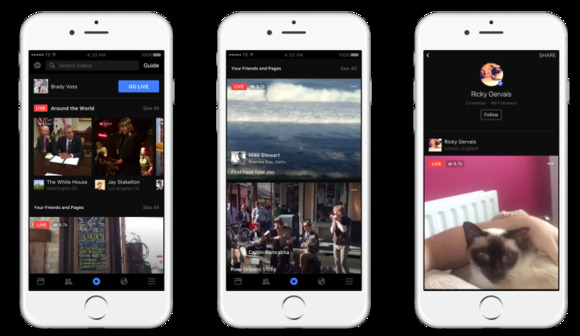 The new Facebook Live API will let publishers and hardware makers build tools that connect with the social network's live video streaming feature. That means broadcasters will be able to stream video from hardware that integrates with the service like DJI drones and the new Mevo camera, along with broadcast software like Livestream, ffmpeg and Xsplit. It's a move to help video producers bring live video to Facebook without having to do something extreme like strap an iPhone to a camera rig, which is what they currently have to do. With the new tool, Facebook also makes it easier for developers and broadcasters to bring higher quality video to Live, too. Users will also have the ability to share a live broadcast with members of a group, or people who are registered for an event, in addition to broadcasting to their friends or to the world at large. People watching a live broadcast can add live emoji reactions, similar to adding reactions to a news feed. The functionality is a push by Facebook to compete with other live streaming services like Periscope, which is owned by rival social network Twitter. With the rise of pervasive, high-speed mobile connectivity, live streaming is becoming more prevalent. Facebook is likely feeling the pressure from its competition, but it's in a strong position, according to Forrester analyst Nick Barber. "Paired with its active users and algorithm, Facebook stands to create a new revenue stream with live events," he said in an email. "It makes Facebook a one-stop shop for users who want to consume news, live events and connect with family and friends." Improving live streaming may make the platform more appealing to people who know they want to stream their event to the Web somehow, but haven't yet decided how to do it. If Facebook can become the de facto home for live broadcasts from celebrities and big brands, that could put the company in a lucrative position. "Recorded video is very engaging on social channels, and live creates even more opportunities for brands and individuals," Barber said. Users are also going to have an easier time finding live video while browsing Facebook. The company is changing its mobile app to provide users with a video tab that will make it easy for them to browse what broadcasts are currently taking place. On the desktop version of Facebook, they'll find a new Live Map that shows them video broadcasts from 60 countries. There's also good news for video creators buried in today's reveals. Facebook launched a Rights Manager feature that lets publishers manage copyright-protected content that they upload to the service and restrict how it gets used by others. It's all part of the avalanche of announcements Facebook made at its F8 developer conference on Tuesday, which include a suite of new platform tools and an API for building bots on Messenger.